St. Matthew Catholic Church is located in the Ballantyne area of south Charlotte at 8015 Ballantyne Commons Parkway, Charlotte, NC 28277. From South Carolina: Take I-77 North to I-485 East. Proceed past Pineville and take exit 59 at Rea Road. Make a right turn onto Rea Road. Proceed approximately .5 miles. At the second light, make a right turn onto Ballantyne Commons Parkway. Make an immediate left to the church property. An alternate route is to pick up Ballantyne Commons Parkway from US 521 North. Make a right turn onto Ballantyne Commons Parkway and proceed 2-3 miles to the traffic light at Elm Lane. The church property will be on the right immediately after going straight through the light. From the North of Charlotte: Take I-77 South to the I-485 East exit. Proceed past Pineville and take exit 59 at Rea Road. Make a right turn onto Rea Road. Proceed approximately .5 miles, then make a right turn onto Ballantyne Commons Parkway. Make an immediate left to the church property. From Matthews: From I-485 West take exit 59 at Rea Road and make a left onto Rea Road. Proceed approximately .5 miles, then make a right turn onto Ballantyne Commons Parkway. Make an immediate left to the church property. An alternative is to turn on Ballantyne Commons Parkway from Providence Road and proceed west. At the light at Rea Road, go straight and the church will be on your immediate left. The 18-acre St. Matthew campus includes a 2,200-seat Sanctuary; the Msgr. 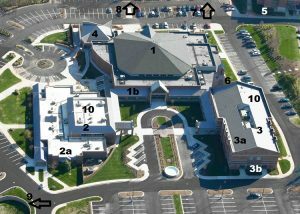 Joseph Kerin Parish Center and gymnasium; the Daily Mass Chapel; the New Life Center; the Church Office; St. Matthew Education Center (School); the Columbarium; Grandparent Garden and a Pet Memorial Garden. The Waxhaw campus of St. Matthew is located at 4116 Waxhaw-Marvin Road, Waxhaw, NC 28173.